Recycling concrete and asphalt from roadways keeps the material out of landfills and is a green alternative to using virgin aggregates for new roads. Today's roadbuilding contractors are using this recovered material and recycling it more than ever before. However, research is showing that some municipalities in Ontario are far better than others when it comes to using recycled aggregate in their roads - and some are far behind. A study conducted on behalf of the Toronto and Area Road Builders Association (TARBA) has shown that Ontario municipalities are all over the map with respect to how much recycled material they use for road construction, with some almost entirely eschewing recycled aggregate - a greener alternative compared to virgin material - for their projects. "There's not a huge commitment to recycling aggregate; in fact, there's a reticence to use the product," explained Rob Bradford, executive director of TARBA. "I think it stems from a fear of trying something new, thinking that something might happen - sticking with virgin aggregate has less potential for risk." According to a study by a researcher from the University of Western Ontario, the allowable use of recycled aggregate across the region ranges from significant amounts in some large areas like Toronto, down to nearly none in nearby Mississauga. Instead, according to Bradford, millions of tonnes of material is either sent to the landfill or into stockpiles. At the same time, those low rates of use mean that new aggregate must be trucked significant distances, burning fuel and generating greenhouse gases, while used aggregate ends up in the waste stream. Recycled aggregate means more sustainable infrastructure, overall, and Ontario municipalities should be doing a much better job - a much greener job - of recycling asphalt and concrete, Bradford noted. "They need to be a part of the solution, rather than part of the problem." TARBA is encouraging municipalities to find ways of using more recycled asphalt in their construction work. Shown here a Metso crushing plant processing aggregate materials. The UWO study looked at construction practices in five regional municipalities and 15 single or lower-tier municipalities across Ontario, conducting a survey regarding approved uses of recycled aggregate for use in a variety of situations. Results of the survey showed a broad range of standards in both road construction and subdivision work. For example, the collected responses showed that some 50 percent of surveyed municipalities do not allow the use of recycled concrete and asphalt as 55 mm aggregate for granular base and subbase for pavement. 40 percent allow partial use and 10 percent allow for full use. The municipalities are even more restrictive when it comes to 19 mm aggregate for granular pavement, with 55 percent not allowing recycled material, 35 percent okay with partial use and 10 percent allowing full use.Ready-mix concrete is the most restrictive use for these municipalities, with 80 percent not allowing recycled aggregate use and 20 percent allowing partial use. On the other side, 50 percent of municipalities are okay with recycled aggregate being used for engineered fill, and 90 percent allow partial or full use for construction access roads, bicycle paths and similar construction. Among individual cities, Toronto - the highest scoring municipality in the survey - allows recycled material for use in everything but engineered fill, stabilization of soft subgrades, Portland cement ready-mix, and in concrete for sidewalks, curbs and other uses within subdivisions. Some other uses are restricted, but for the most part full use is allowed. "I'm really pleased to see that," Bradford said. "Sometimes there's an intent to do what's right, but it doesn't get down to the foot soldiers. If we have an issue in the city of Toronto, where virgin aggregate has been called for in a tender that should have some recycled material, we'll give them a call, and they address it. "On the opposite end of the spectrum is Mississauga, which allows full use of recycled aggregate only for construction access roads, bicycle paths and similar features. No recycled product is allowed for any other road construction projects. Bradford suggested that much of the disapproval of recycled materials in municipal policy may come from lingering concerns about quality - something that has improved greatly with the growth of the aggregates recycling industry. "You have to ensure the quality of recycled aggregate - it has to be an engineered quality, it has to be properly processed and tested. Like any material, going back 10 or 15 years there are probably a couple of things that have stuck in peoples' minds from when it was used in the infancy of the industry where it didn't work out because quality control wasn't what it should have been," Bradford said. "If you're a consultant working for a municipality, or you're an engineer in charge of the roads department, that kind of decision is a risk - so, you play it safe and just specify virgin aggregate." This trend of specifying new material creates many issues for contractors who have to manage the aggregate removed from jobsites, Bradford noted. "The owner just writes off ownership in the contract, so the contractor has to find a place to get rid of anything that comes off that project. Now, if they produce recycled aggregate themselves, they will take it to their yard and pile it up. If they don't, they have to find someone who does produce it. . . or dispose of it in the landfill," he said. "The point we're reaching now is. . . there's so much of the stuff, they will have to start charging to take it in, and second they're going to have to turn people away." Moving forwardTARBA is encouraging municipalities to find ways of using more recycled asphalt in their construction work. One example Bradford pointed to is the Ontario Ministry of Transportation, which currently uses 20 percent recycled materials in its highway construction. "They've been very forthcoming about their commitment to reusing recycled aggregate. . . they're using tens of millions of tons a year. If you can put this material under highways that carry the amount of traffic that ours carry, then surely there's an argument for using it under a municipal street," Bradford said. 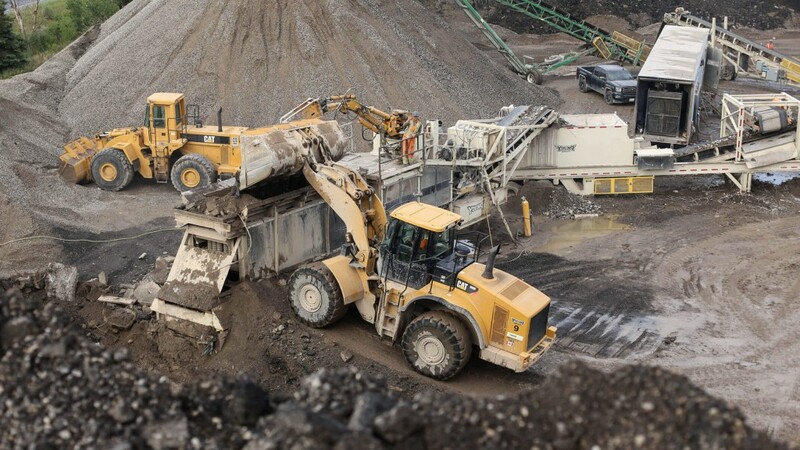 Only about seven percent of the aggregates used in Ontario currently come from recycled sources, as opposed to European countries which use up to 20 percent recycled product, Bradford noted. That's a goal he said TARBA would like to see municipalities aim for. "We are encouraging municipalities to use the Ministry of Transportation model. If municipalities have the same attitude and the same practices as the MTO, we as a province would be recycling close to the levels that we should be, and which are supportable from a technical standpoint," Bradford said. This article was originally published in the January/February 2019 edition of Recycling Product News, Volume 27, Number 1.